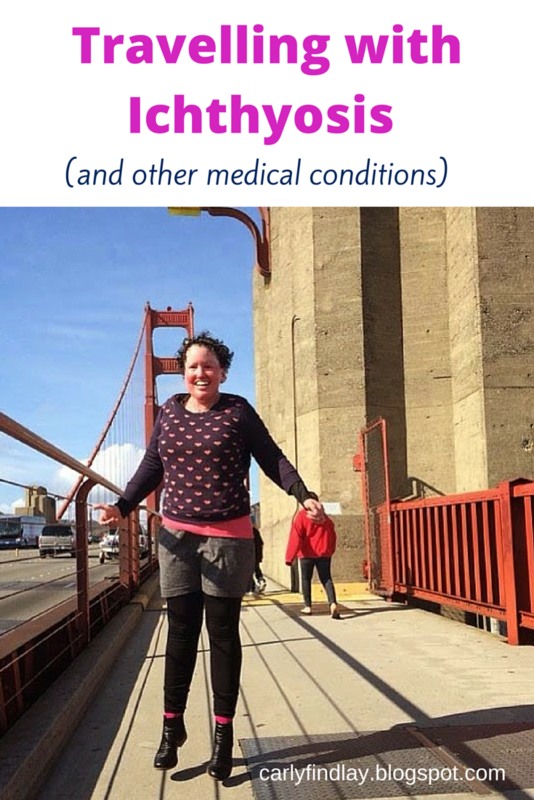 Travelling with Ichthyosis (and other medical conditions). I don’t have many regrets but one is not travelling earlier. I never saved enough, and always feared it would be detrimental to my skin – which is affected by rare, severe and painful disorder called Ichthyosis. Now I’ve been on two 6-7 week overseas trips, and want more! I realised that just like with daily life, travel is not going to be comfortable every day. It’s definitely a period of getting out of routine and comfort zones (like showering in a public airport shower – never thought I’d do that but so glad I did as I was comfortable for my longhaul flights! ), and my skin changed with the cabin pressure, various outside temperatures and busy schedule. But I couldn’t let Ichthyosis stop me. I want to see the world! I wrote this Facebook status when I was in London at the Generator Hostel – the coolest hostel ever. It was such a proud moment. I don’t usually let anyone see me before I have had a morning shower. You see, I don’t wake up looking like the photos I post here, or how you see me in person. I must put my face on to greet the world – or more realistically, take my overnight face off. Ichthyosis means the skin renews a lot overnight and I wake up with a very scaly, very hard to move face. Maybe like Botox meets facial peel. Hideous. So it’s been a big feat for me to forgo some of that privacy these past six weeks – staying in hostels and with other people. And it hasn’t been so bad. I still don’t look at people in the eye before I have had a shower but I can manage to go out of my room into the bathroom past people. When I was in London in May 2014, I met up with Julie, Danny and Jack again – five year old Jack has Netherton’s Syndrome (pictured above). We talked about travel – Julie said she couldn’t believe I was travelling on my own around the world for almost two months. I told her I wished I’d travelled earlier – when I was younger. 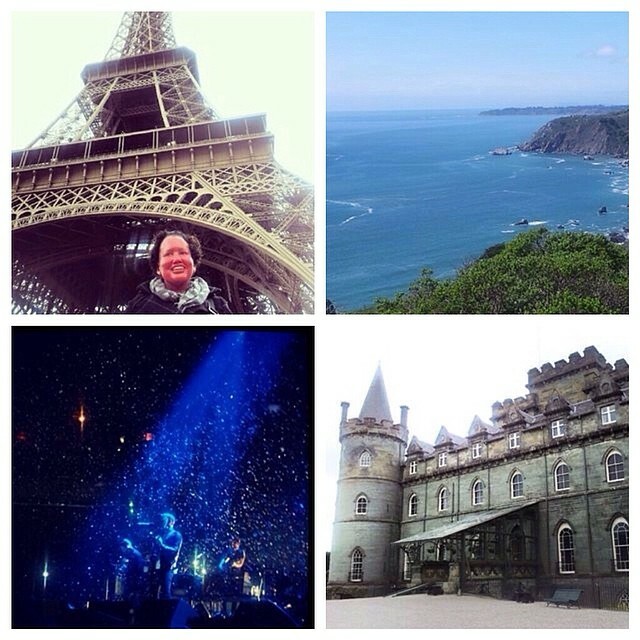 I’ve done two overseas trips in two years. Yesterday marked three months since my most recent trip, and two years since my first trip. As I wrote when I returned from my last trip, it’s so important to plan ahead and be proactive about communicating your needs. Julie said she’s worried about how Jack will go travelling. She and Danny are reluctant to take him on the London tube because it might be hot. I reassured her that the train is not stifling, especially when I was there – the weather was quote cold! I also suggested they start small with international trips – maybe catch a train to Disneyland in Paris, or a European country close to the UK. Europeans are so lucky with the proximity of surrounding countries. Finally I said to Julie that she could ask Jack’s dermatologist if there’s a dermatologist at the holiday destination they can connect with. I said to Julie that while I know she wants to make sure Jack is comfortable at all times, there will be times when he might have to wait a little longer for his bath. After that conversation, I had a think about some of the other things I’ve done to cope with my Ichthyosis during travel. Julie said she’d love to read my advice, and I’m sure it will be useful for other patients with Ichthyosis who want to travel. This is a little more costly but make sure you get travel insurance to cover your additional medical condition. I asked around for insurance providers that do this and a friend who’d had cancer treatment before her last trip to America recommended me an insurer that was more affordable than my bank’s insurance. I went with Defence Health – but you should do your research. The basic travel insurance was $100 for my trip – and the cover for my Ichthyosis was an extra $500 – I paid $515 to remove the excess. I was told that travel insurance for America is costly because of their healthcare system, so if you’re travelling to other countries, it might be cheaper for you. I didn’t claim on my travel insurance for either trip but I felt confident that if I did get sick, I would be covered. The great thing about Defence Health was that my details were on their system from the first trip I took, so I didn’t need to provide extra documentation. Had I gone with my bank, the excess would have been $5000 for an existing condition – even if I got sick with a tummy bug. Pack all the medications and creams you need for the trip. This ended up a little heavy for me as for seven weeks I took 10 kilos of paraffin cream. But I was worried that I would not be able to get the equivalent overseas at an affordable price. Next time I travel will probably be shorter so I won’t need to take as much. My dermatologist wrote me up a script so I could buy double the amount of cream I usually buy per prescription – this meant I would save some money as I’d only pay for one script. I also made sure I took two packets of antibiotics, enough antihistamine and painkillers to last me few trip – and separated a few of them for my carry on luggage. I know I can get painkillers overseas but my skin has reacted to medications and I don’t know the ingredients of some of the American medications so I’d prefer to carry a trusted brand with me. You can also speak to your doctor about equivalent medications and creams at your holiday destination and purchase them when you arrive. I also took a travel sized shampoo bottle full of washing powder so I had some when I arrived at my first destination and then bought a bottle of sensitive stuff which I carried around for my trip. I also took a pair of latex free gloves in case I couldn’t easily find a packet in my travels. Well before my trip, I purchased over the counter stuff from discount chemists, which saved me money. I’d buy a couple of things each pay. Get a letter from your doctor and contact the special needs department of the airlines. My dermatologist wrote a letter which I forwarded to the airlines and I also got my dermatologist to complete relevant medical forms as well. My doctor explained what Ichthyosis is, outlined the type and quantity of cream I would be carrying – plus the purpose of the cream, listed the other medications I’d have and their purpose, and also requested extra legroom to allow me for increased movement on long haul flights, and they also asked for extra water on the flights. It was also stated that I don’t have fingerprints which might make security checks hard. The dermatologists requested I got extra luggage space included for free – most large carriers allow included luggage for medical equipment – and so most airlines I traveled with for the international flights viewed my creams as medical equipment. I just paid for each case I checked in through the domestic flights in America. Contacting the airlines with my medical details proved to be difficult this time around and I ran into some issues at the airports – that’s another story for another blog post. All I can recommend is to persist, tweet the airlines if you have no luck, and visit their office in person with your documentation if phone and email contact fails. I printed my medical letter and laminated it to show to staff at each airport. I’d show it at the check in and then the security. Most airport staff were fine with the letter but it was very difficult with the Transport Safety Staff in America because of the amount of paraffin I carried. Air New Zealand was AMAZING but some other airlines were tricky to deal with – perhaps due to the cultural barriers around disability. Here is my experience with Air NZ. Locally, Virgin has sought more information about my skin before I boarded. Here is my medical letter. I am sorry for the inaccessibility of the document – it’s a scanned PDF. 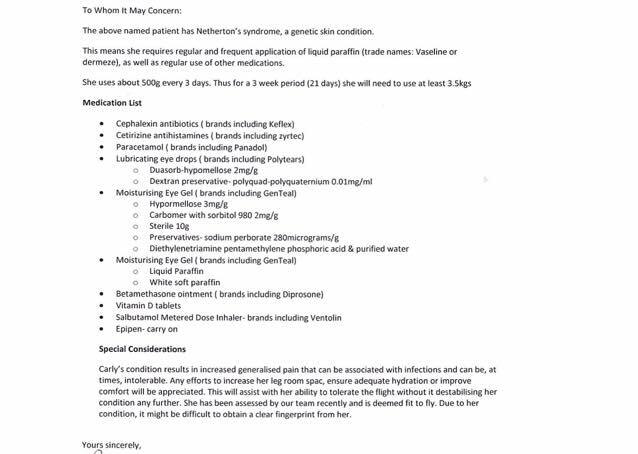 For those using screen readers, it contains an explanation of my condition, medical recommendations as well as a list of medications I took, and the duration of the trip, and the trip dates. It obviously had the doctor’s name and signature, plus the letterhead on it. Travel means amazing food for me – I want to try everything! I ate some amazing food while away, but it was very rich. I tried to have vegetables with each meal and when I couldn’t, I would buy a vegetable smoothie. I’d also try to start my day with some fruit. The air conditioning and heating dried my skin out so I made sure I drank enough water; in Chicago, it was so cold outside and my hostel room was so toasty, but I didn’t have a fridge or tap in my room so I’d forget to drink water when I was there. I bought a big bottle of water to keep in my room to stop the dehydration. I wore soft clothes on the plane. Not pyjamas but soft, stretchy fabrics like I would at home in the evening. I took fluffy socks too. And I also had a disposable cloth in my carry on so I could wash my face when I woke up. It was VERY comfortable. Movies were great, as were books. I prepared my body for a jam packed holiday ahead on the plane trip. Holidays can be tiring. I was gone for almost seven weeks last year and there were days I just wanted to be at home watching TV. I tried to get rest by going to bed at a reasonable hour when I could, breaking my day into three sections and only doing activities in two of the sections, and making sure I ate well. I was sick for almost a full week and getting over a cold and chest infection away from home was hard. I can’t take cold and flu tablets because they affect my skin. I didn’t want to go to the doctors until I was almost dead (because travel doctors cost a heap – and I didn’t want to have to explain my skin to a new doctor). I was coughing up infected mucous and felt terrible so I took antibiotics and went to the pub to have two brandy and ginger ales a day. I was lucky to be staying with family when my cold and chest infection, so I was able to rest in bed and had access to lemon and honey. I also grabbed berries and chicken soup from the fantastic healthy fast food stores in London (Marks and Spencer Food, Itsu and Eat). Travel is a great way to meet people, and of course, blogging can put you in touch with people all over the world. I am so fortunate to have built a big network of people affected with Ichthyosis. I made the time to meet people with my rare skin condition. 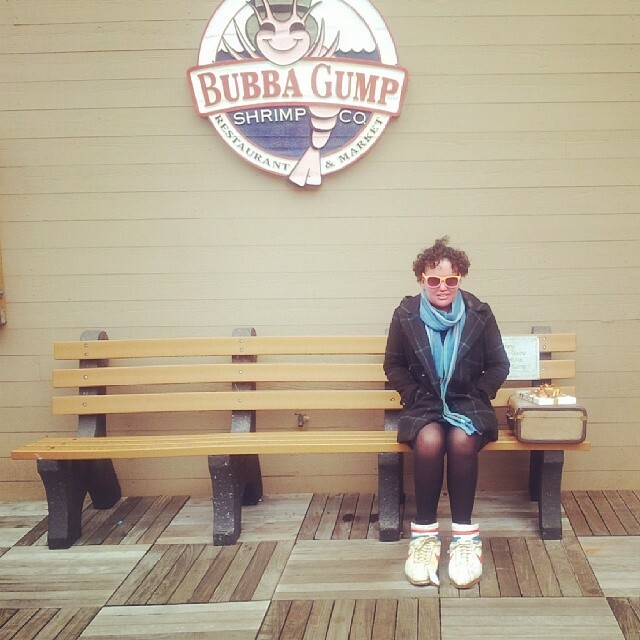 I met so many people with Ichthyosis in America and England – it made me feel less alone and we all learnt from each other. 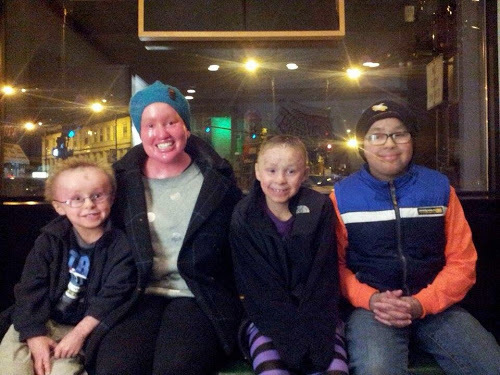 Here is Matthew, Michael and Aurora who all have Ichthyosis – I met them in Chicago. Such beautiful kids. Read about who else I met here. I had a hard time adjusting to the different shower water around the world – the water was either hard or soft and the water temperature in each hotel room differed. I hate washing my face with cold water – and when I was in San Francisco, the water was tepid. So I asked the hotel staff for a kettle so I could boil water to wash my face. I also had very sore skin in Paris and I didn’t have access to a bath. I did have a stove a saucepans though. I bought a pack of salt (it was hard to ask for it in the supermarket when I didn’t speak French – it’s ‘sel’, if you’re stuck in Paris) and some microfibre dishcloths so I could do my own dressings. I boiled a saucepan of water, added a liberal amount of salt plus two cloth, let the water cool, and then used the cloths as compresses on my legs. Infection healed in a few days! It’s not going to be easy travelling with Ichthyosis. You’ll encounter lots of questions and stares (when I encountered stares in Paris and Milan, I just smiled and said “bonjour” or “bongiourno” which was met with a polite greeting back), need to explain your condition to many companies, and you won’t have your creature comforts of home. But it will be so much fun and so worth the preparation. And don’t forget, there’s always the online support groups where you can ask for localised advice. Happy travels! Do you have any trips planned? Any tips? For the British Jack thinking about travelling around Europe: Extra travel insurance to cover health costs probably won't be necessary (depending on which country he's visiting and what healthcare system they have) because of the EHIC. Great post for anyone with any sort of medical condition or needs. I have food allergies (life threatening to all animal-based milks, cheeses, etc) and eating abroad (even locally at home) can be quite scary so I travel prepared. Two additional tips – when traveling overseas, do some research and see if your medications are available overseas but under a different name. I work in Emergency Medicine and have encountered a couple of medications from international travelers that are identical to their US counterparts but with different names. 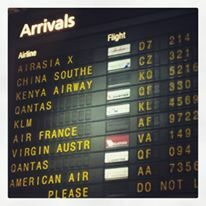 Having the names used in the country you are traveling to can save time. If your condition is potentially life threatening like my food allergy, have information about your condition and needs translated into the language of the country you are traveling to. When I went to Mexico, I had both medical information and my dietary needs translated into Spanish and also had a small card laminated for use in restaurants so that I could easily inform waiters, chefs, baristas, etc of my dairy-free needs. Worked like a charm! Thankfully, I have never needed to use it, but my medical information is one a single page that is also laminated and can easily be handed to medical staff at a clinic or hospital. I keep a non-laminated copy folded in my wallet and another folded up in my toiletries kit. A family member also keeps a copy on file so that if I have an emergency they can scan, fax, or email it to the appropriate people.